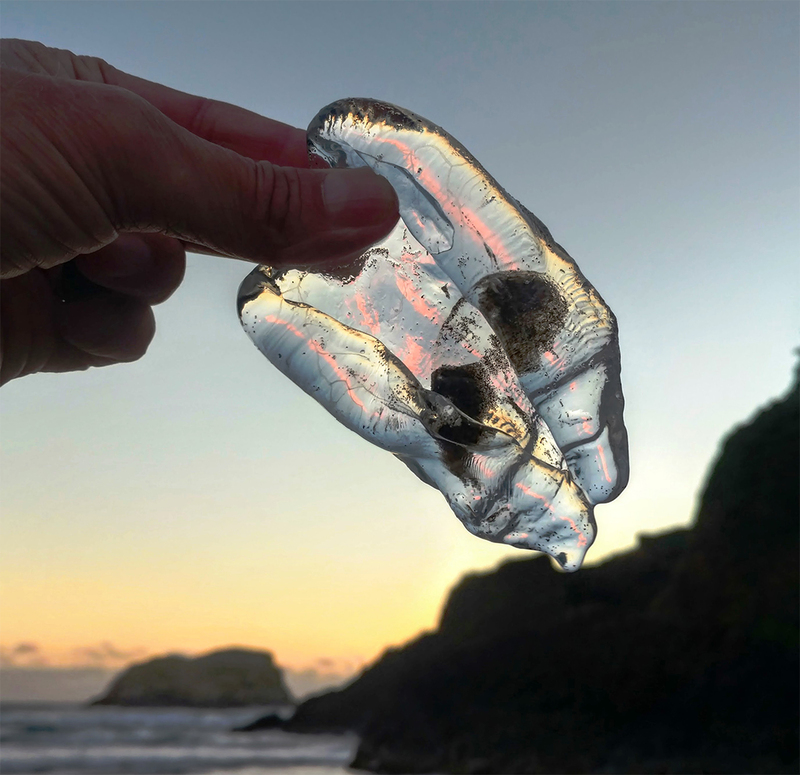 Numerous strange gelatinous creatures wash up on Oregon’s beaches every year – everything from jellyfish to strange pickle like organisms called pyrosomes. Today we wanted to highlight salps, a lesser known group of organisms. We’ve invited guest author and photographer, Stephen Grace, to share this story and some of his photos on salps. 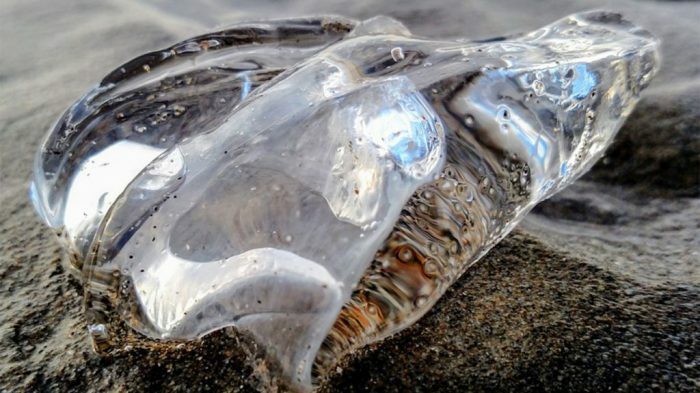 Some of the gelatinous creatures that wash onto Oregon’s beaches are salps. Though salps resemble jellyfish without tentacles, they belong to a group of animals known as tunicates, commonly called sea squirts. In their larval phase, tunicates possess a primitive backbone structure, making salps more closely related to people than to jellyfish. Stranger yet, we are closer kin to a salp with its rudimentary spinal column than we are to an octopus, an invertebrate mollusk that seems almost humanlike with its playful personality and its remarkable memory, curiosity, and problem-solving skills. Sometimes I stare at a blob of salp goo on the sand and let the bizarre fact that we are cousins in the same phylum bubble in my brain. Salps look like lumps of limp gelatin when they’re stranded on the beach, but in the ocean these barrel-shaped creatures with openings at both ends contract muscle bands to pump water through their transparent bodies, moving by jet propulsion. When a salp pushes water in one direction, its body moves in the opposite direction in accordance with Newton’s third law: For every action, there is an equal and opposite reaction. As these gelatinous rocket scientists pilot their way through the sea sucking in water and expelling it, they filter the water for the tiny phytoplankton they eat. Salps are also considered plankton. Even though they are much larger than the microscopic organisms they consume, salps are carried by currents stronger than their jet-powered motion. The word plankton comes from the Greek planktos, meaning wandering. As salps wander the sea grazing on algae, they provide a gelatinous feast for fish, seabirds, sea turtles, and siphonophores like the Portuguese man o’ war. The salps we see on the beach represent one part of a strange lifecycle that involves both solitary salps and salp aggregations. A solitary salp reproduces asexually by budding a chain of clones that create light. The individual salps in a luminous chain remain attached as they swim; these strands of glowing strangeness can stretch more than fifty feet. The chains of some species form complex shapes such as giant wheels, and even a double helix. Salps that are linked together communicate through electrical signals to synchronize their movements, and a chain of harmonized beings pulses brightly as it snakes or spins its way through the sea. When salps reproduce sexually, things really get interesting. Each member of a salp chain is a sequential hermaphrodite. A salp starts life as a female and then turns into a male. An older salp that has transformed into a male fertilizes a female; as a fertilized female grows older, it becomes a male that fertilizes a younger female. If salps could tell stories, oh the stories they’d tell. A fertilized salp female broods her embryo, nourishing it through a placenta-like membrane until the young salp can survive on its own. After emerging from its mother, the salp grows into a solitary creature that buds its own chain of clones, which are sequential hermaphrodites that reproduce sexually. And so on, in one of the many mind-boggling lifecycles of creatures in the sea. We may one day travel to distant worlds and discover forms of life that don’t seem as otherworldly as a glowing, gender-bending salp chain using jet propulsion to travel Earth’s oceans as it feasts on the tiniest organisms in the sea. Asexual cloning is an extremely fast form of reproduction. But cloning can lead to an evolutionary dead end because it doesn’t result in the genetic diversity that a species needs to adapt to changing conditions in the environment. Sexual reproduction creates genetic diversity within a species, but it’s a slow way to reproduce. Our salp cousins have arrived at a strategy that combines the best of both reproductive methods. When food is abundant, salps clone themselves extraordinarily fast. Their populations explode to take full advantage of the bounty; staggering numbers of salps gobble up vast blooms of algae. A single swarm of salp clones can cover hundreds, or even thousands, of square miles. And because of the constant gene shuffling that comes with the sexual reproduction of salps, when the environment changes, some individuals have the genetics necessary to deal with the shifting conditions. We have explored less of the ocean floor than we have the surface of Mars. Think of the strange beings yet to be discovered in the seas of our planet. There is no end to the weirdness beneath the waves, and each creature stranded on the shore tells a story of survival and adaptation in the watery world where our own species began. The salps that wash ashore reflect and refract light in a dazzling display. Each gelatinous tunic acts as a sort of prism and lens, magnifying sand and breaking white light into bright colors. Who needs drugs when salps are washing up on the beach bearing rainbows in their alien bodies.